In this before and after the client had two issues. The first was that she wanted here backyard bursting with blooms. She is a plant lover and wanted us to create beds for a real "hort-head" collection garden. The second issue, even though this bare grassy hillside looks innocent enough, every time it rained, water was pouring into the basement and compromising the foundation. Creative garden design can fix both! First we came in with an excavator and moved some of the dirt off the hillside. We wanted to create a path for water drainage AWAY from the house. As we excavated, we happily unearthed some spectacular rock outcroppings and married them with a dry riverbed for drainage when it rained. We transformed this boring and problematic hillside into an outdoor space that was full of character...and we hadn't even brought in plants yet! Two years later, all the small perennials have filled out and the garden is a raucous explosion of blooms. 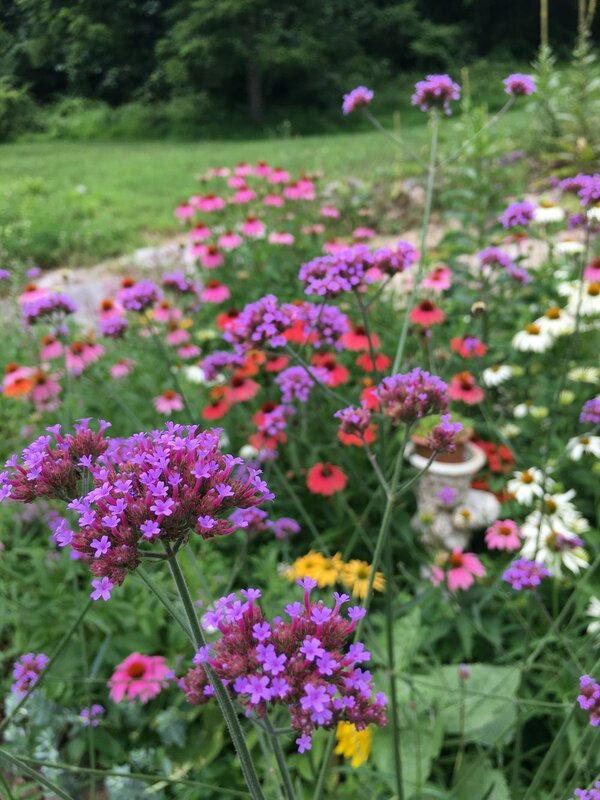 This is honey bee heaven and you can hear the delightful buzz of healthy pollinators and watch the many Monarch butterflies flitting around in this beautiful garden. That's one of the many butterflies flitting from bloom to bloom. 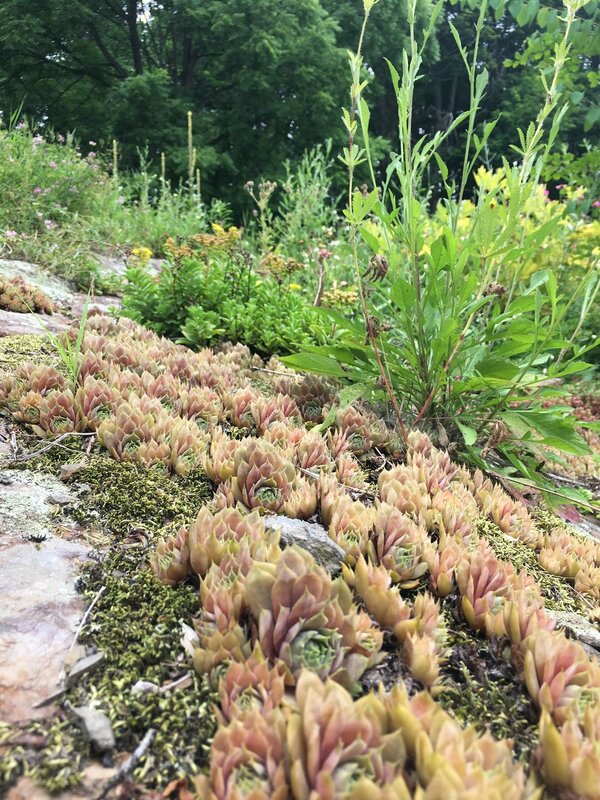 The exposed rock outcropping is now colonized with several varieties of sedum, adding yet another layer of color and texture to this once boring hillside! At Victoria Gardens, every dramatic before and after begins with an hour long on-site consultation by Victoria. This visit allows the designer to see the space you envision becoming your garden and allows you an opportunity to express your desires and ideas and ask any questions you may have. Design consultations are $150 and can be scheduled by calling the shop at (845) 658-9007. This before and after is a funny story, because in 2000, Victoria did a design consultation for this property. She made a recommendation to rip out the big Yew and a Hemlock hedge that had taken over the walkway and make a sloping garden, which would highlight the lovely Dogwood tree that was there. The home owners did not move forward with the big project, but did a smaller project instead. Seventeen years later, they said yes to the garden they deserved! This year, 2017, we ripped out the big Yew and Hemlock hedge that had taken over the walkway and we installed a sloping garden, which now highlights the lovely Dogwood tree! It was meant to be, obviously. At Victoria Gardens, all our projects begin with an hour long on-site consultation with Victoria. This visit allows Vic to see the space you envision becoming your garden and allows you an opportunity to express your desires and ideas and ask any questions you may have. At the end of this hour, you will have been provided some great ideas, information on considerations for your garden site and some idea of how we will proceed with a design concept. A Landscape/Garden Consultation Visit cost is $150. Yes! I need a consultation! You can read more about Victoria Gardens' design consultations and see more of our projects here and here. The finished project was an exciting collaboration between Walter Cudnohufsky Associates (landscape architect) and Victoria Gardens (garden design). The front yard was an example of reclaiming space by eliminating part of the driveway. Where there was once asphalt, the front walk now leads visitors through a peaceful grove-like garden to the front porch and welcoming entrance. For the multiple levels of gardens, low maintenance, drought-tolerant plants were chosen to create a tapestry of textures and colors to reflect a more modern feel and enhance the stone walls and paths. We can help you with your landscape project… big or small. 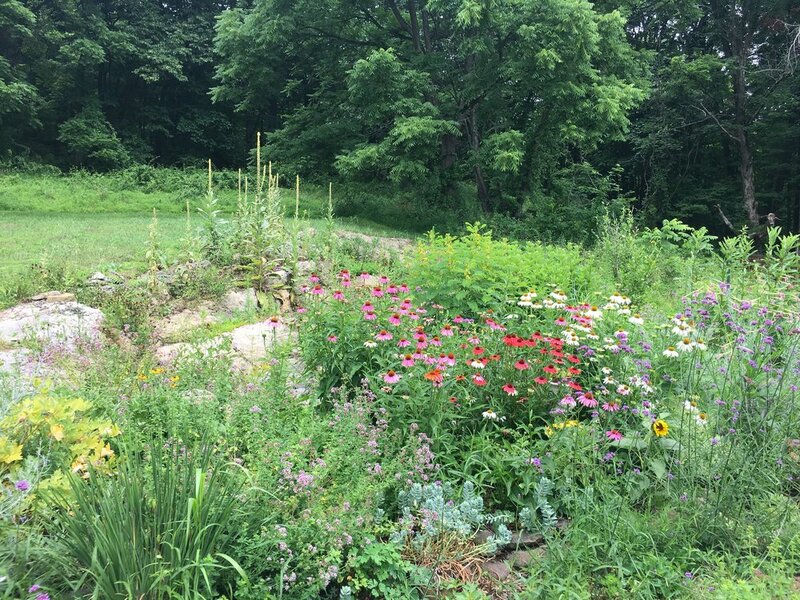 Victoria Gardens in Rosendale, NY has been designing and installing gardens in Ulster County for 30 years. We’d love to help you shape the backyard of your dreams. Beat the heat and have the Victoria Gardens’ crew weed your garden! When we finish a landscape and garden renovation project like the collaboration above, we will often set up a maintenance–once a month, twice a month–in order to keep the gardens looking picture perfect. 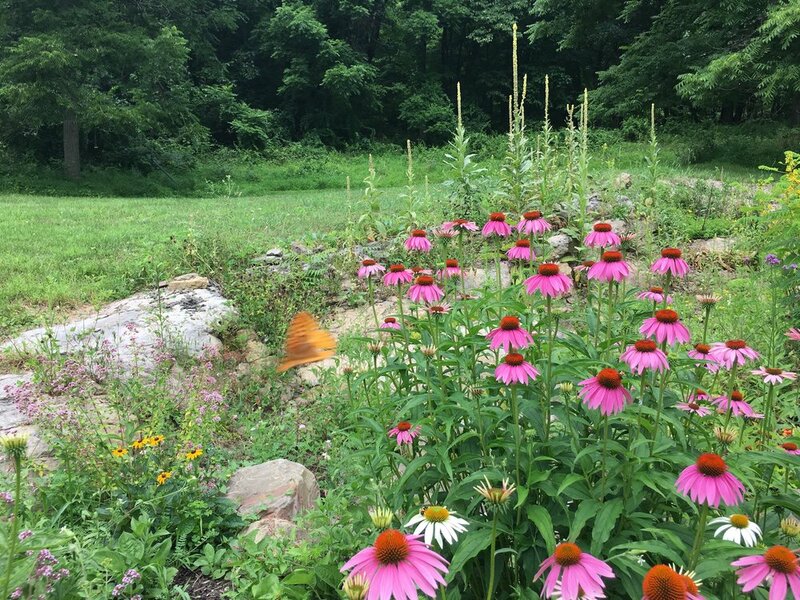 After almost 30 years garden design, landscaping installation and maintenance in Ulster, Dutchess and Sullivan counties, Victoria Gardens has made clients happy by thinking out of the box. And sometimes out of the driveway! This before and after is the perfect example of a driveway that was inhibiting how the clients were enjoying their outside space. The gravel driveway came all the way up to the back door. This separated the house from a set of outdoor stairs, which led to the pool. You had to traverse across sharp gravel, weave in and around parked cars, and run into the FedEx guy in your bare feet and bathing suit every time you wanted to take a dip in the pool! Not even consciously thinking about it, that becomes a passive barrier blocking the client from spending optimal time enjoying their pool. But what’s a person to do? Isn’t the driveway literally set in stone? You are not limited by existing walkways, garden beds, or even driveways. Victoria and her crew have dramatically transformed outside spaces to the surprise and delight of clients. We brought in the backhoe and tore up the driveway. We brought in stone dust and flat stone for the new patio. The patio was designed to blend in with the natural rock outcroppings in the hillside next to it. Victoria picked out ferns and sedums to be planted in and around the rock outcroppings to feel natural at the edge of the wooded area near by. And we brought in square stone for the retaining wall and stairs that would define the new reclaimed yard from the now (much!) smaller driveway. We moved the fence back to around the pool area. Then we brought in new soil to make garden beds and level out where we had dug out the old driveway – adding to the size and openness of the backyard. And waited for the grass to grow! Now our clients walk out their back door into the privacy of their new backyard, across the new relaxing patio, past their newly planted garden beds, and head to the pool. The new garden beds were planted with a variety of deer resistant perennials, ferns, grasses, and ground covers. Victoria Gardens helped our clients reclaim hundreds of square feet on their property for their privacy and enjoyment. But what about the poor cars? Don’t worry, there is still enough driveway to park 3 or 4 cars if necessary. And now there is a real entrance! As you climb a few stone steps, you are led on a whimsical curving path of stepping stones to the front porch. Leave the outside world behind as you step into a backyard that feels like a sanctuary in the country, instead of a parking lot. Any project by Victoria Gardens begins with an hour long consultation with Victoria. The purpose of a consultation is to allow the designer to see your property and gives you the opportunity to ask any questions and to express your vision, wishes, and requirements for the project. Call (845) 658-9007 to make an appointment or visit our Nursery and Garden Center on the corner of Rt. 213 and Cottekill Road, between Rosendale and High Falls. At Victoria Gardens you will find a selection of trees, shrubs and perennials that are chosen specifically for our area and for our customers most frequently voiced problems: deer, dry soil, wet spots, and shady areas. Our knowledgeable staff will help you find the perfect combinations, so you only have to plant once! This cheerful home is set on top of a gentle slope overlooking a picturesque meadow. When you approach the house, you drive up the hill, through the sunny meadow and pull around the back of the house to a shady courtyard. To make the transition from “driveway” to courtyard and welcoming entrance, Victoria Gardens added a gently trickling water feature. The sound has a soothing effect. It allows the residents and guests alike, to leave the stresses of the outside world parked right next to where they left their cars. In a corner with the client’s house on one side and a retaining wall on the other, creating a natural looking water feature was essential to a sense of “belonging” in the setting. Victoria’s crew brought in and arranged large stones, burying them in the ground to create a landscape within the landscape. 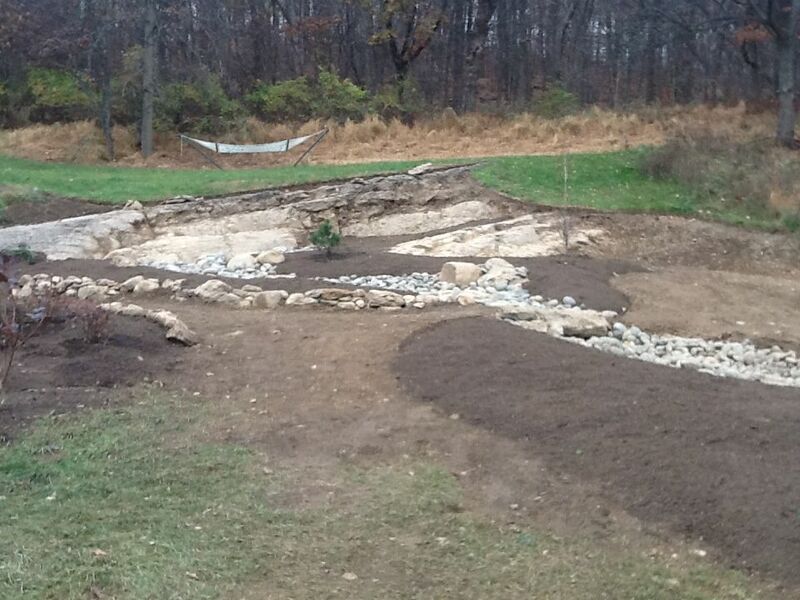 Inspired by Buddist traditions and aesthetics, Donna artfully builds the Asian-influenced water feature. River stones edge the water feature and the pea gravel walkway. Bright green perennial sedum and deep purple, flowering Ajuga were planted in-between the rocks, and water plants function both as ornamental features and as natural filters. Victoria Coyne and her crew at Victoria Gardens have been designing, installing and maintaining gardens in Ulster, Dutchess and Sullivan counties for almost 30 years. Click here for details about arranging a design consultation or call 845-658-9007. Or visit our landscaping portfolio to see more of Victoria Gardens’ projects. This dramatic before and after began by redoing the front sidewalk. A wide curved walkway leading to the house makes visitors feel relaxed and welcome. Using the bluestone from an old, damaged walkway and some imagination, the Victoria Gardens’ crew created a beautiful, functional walkway. The soft, chartreuse foliage of the Japanese forrest grass, brightens up this shady front garden. And planters with annuals and sweet potato vines add an ornamental flourish to the entry way. The entire front garden was planted with a selection of evergreen shrubs and small ornamental evergreen trees, Japanese maples, and shade perennials. All of the plants selected are extremely cold hardy to survive the Ulster County winter. Many foundation plantings can be damaged by snow and icicles at the roof line. To prevent damage, manage drainage away from the house, and as an ornamental detail, Victoria used river stones in the front garden. To the left of the entrance way, Victoria added a dry stream bed to deal with drainage issues and built up the garden beds, creating a lush planting winding its way down and around to the back yard. 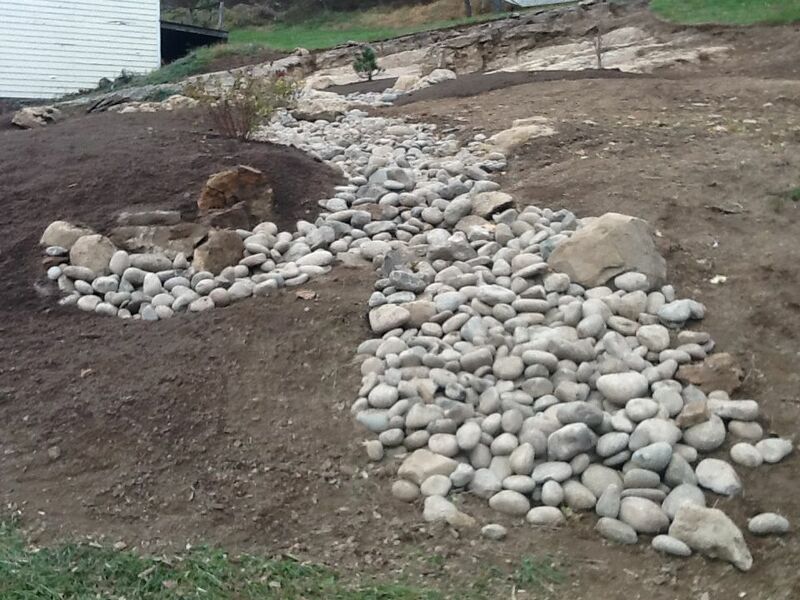 Around the side of the house, an existing stone retaining wall was washed out and not planted. Victoria added soil, created a level grass walkway, and planted both sides of the walkway leading to the back yard. We hope you’ve enjoyed the before and afters of this garden makeover. Hopefully you’re inspired to make your garden even more enjoyable and more beautiful! Whether your outdoor space needs a major transformation or a minor adjustment, Victoria Gardens in Rosendale, NY can help. 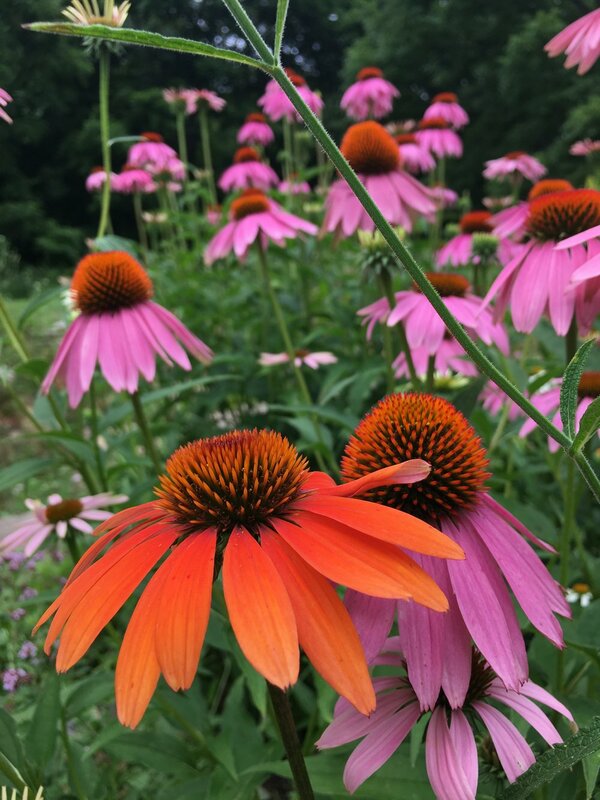 After almost 30 years designing, installing and maintaining gardens in Ulster, Dutchess and Sullivan counties, Victoria and her crew have seen first-hand what plants thrive in our area. It is hard to believe, that when Victoria Coyne and her husband, Wayne Waddell saw this turquoise, abandoned, cement block building, that they had a vision of a unique garden center with mighty sugar maples holding up the high, lofty ceiling. Or that the back doors would open onto a shelf of bedrock that would become home to the Victoria Gardens’ nursery. The shop is awash in greenery and stocked full of all the latest plants of interest; trendy foliage, succulents & cacti, petite fairy garden plants, lush ferns, pet- friendly plants, the best air purifiers — truly something for everyone. We promise that you’ll leave with a new plant friend to nurture for years to come. The Victoria Gardens' landscaping crew are experienced and knowledgeable gardeners. Besides designing and installing new gardens, we also offer maintenance, spring cleanups, pruning, transplanting, weeding, and mulching. If you are trying to find a special variety, call us and ask. We have a wide range of growers in our network and we can place special orders to meet your needs.